Lander released a new feature that will make your campaigns even more effective and engaging: Confirmation Pages. In addition to how to set it up on your landing pages, we've come up with the best tips on how to use confirmation pages to boost your campaigns. A thank you or confirmation page takes action right after a conversion to tell your leads that the process was successfully completed. 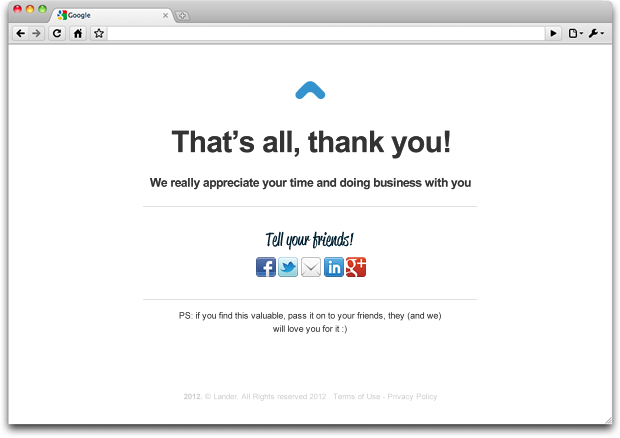 Even when it’s ok to use it just to say thanks, you’d be missing a lot of the confirmation page’s power. With Lander’s confirmation pages, you can engage or remarket your users with primary or secondary actions that will help you improve your business results. There are plenty of options: motivate your visitors to share in social media, add a download link after filling a form (such as an ebook), add custom conversion codes (for adwords) and more (check out Why should I customize it? at the end of this post for some good ideas and examples). How can I add it to my landing page? Setting up your confirmation page will take just a minute. Follow these easy steps to start including them in your landing pages, you won’t regret it! 1. Create a form for your landing page. 2. 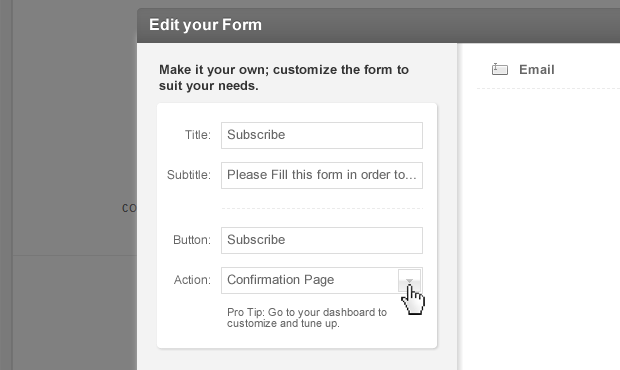 Setup Confirmation Page as an Action in your form settings. 3. Go to your landing page’s dashboard to customize it. 1. Do the visits on my confirmation page take visitors from my overall plan limit? No, the visitors will be counted from your landing page only. 2. Is this feature available to paid users only? No, all Lander users (free and paid) can use confirmation pages. 3. Do I need to add Google Analytics to my confirmation page? No, use the Google Analytics integrations to automatically add GA to your landing page and confirmation page as well. 4. Can I a/b test my confirmation page? 5. How do I customize my confirmation page? Locate the Confirmation Page field on your landing’s dashboard and click on “Go to Editor” to customize every piece of your confirmation page. 6. Can I add images or videos? 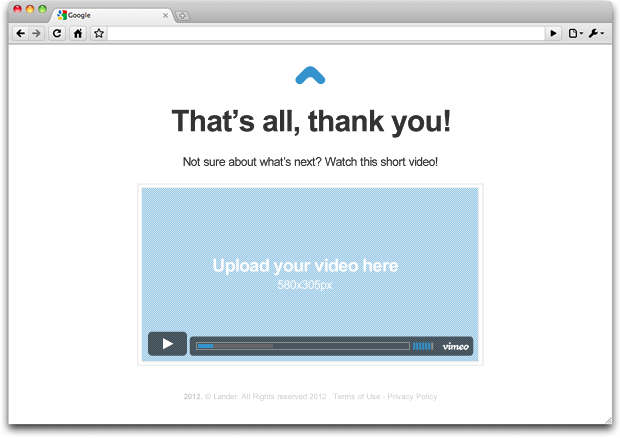 Yes, you can include images or videos just as in any landing page. 7. Can I change the confirmation page url? 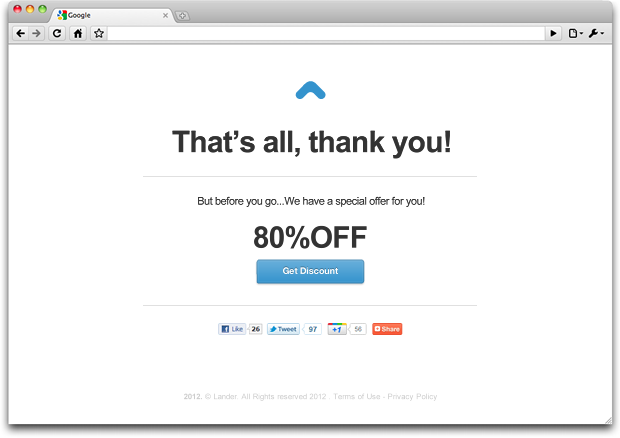 No, the url will always be example.com/confirmation, including landing pages with custom domains. That’s why Lander won’t let you have a landing page with that url. Why should I customize it? If you are short of time, Lander has a default confirmation page ready to use for any kind of landing page. But here at Lander we want to help you get the most out of your campaigns, so we’ve gathered some tips to start using Confirmation Pages like a pro. If your visitors made it to your confirmation page, means they liked what you’re offering them. This could be a great time to lead them to your Facebook, Twitter or LinkedIn profiles to keep them quickly updated and keep the conversation going. Also it could be their chance to share the landing page with their friends (in case they haven’t done it yet). People love free gifts and discounts, so why not use your confirmation page to give a special offer to your leads. Make them start using your product or service right away, but give them a good reason to do so. That could also mean an increase of your landing’s social shares. Let’s say you have a blog post about what your landing page is offering or an ebook regarding your topic. Then you can use it to maximize your landing page results by adding a download link or just a simple link on your confirmation page. For example, in case your landing page is a subscription to a webinar on conversion optimization, you can offer an ebook download or to add a link to your blog post How to optimize your website and increase conversions. That way you’ll keep your visitors engaged and you’ll become a reference in your niche. The confirmation page is the best place to let your leads know what action they should take next. You can add a tutorial video to guide them into your login or explain how your product or service works. A video it’s a quick and entertaining way to describe complicated process or to introduce new customers into your product/service. There are plenty of options depending on your specific goals. You just need to keep in mind to always provide value to your visitors in order to keep their attention. Also, try to make confirmation pages as simple as possible, so that it’s easy to understand that the process is actually done. Include a clear headline that indicates to your new leads that they are in the right place and use only one of the tactics we’ve told you at the same time or you’ll confuse your visitors. Lander’s new feature lets you create good-looking confirmation pages in seconds, allowing you to use any of the tactics we’ve told you and all the ones your imagination can come up with. It’s easy as pie and will bring you great results. 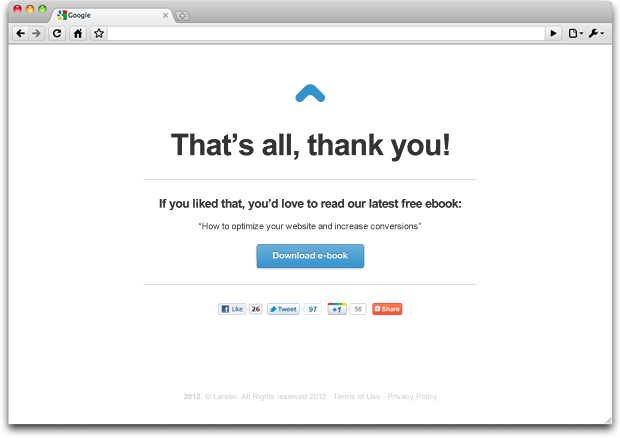 Now you have all what you need to start boosting your campaigns with neat thank you pages. What are you waiting for? Create your confirmation pages now!